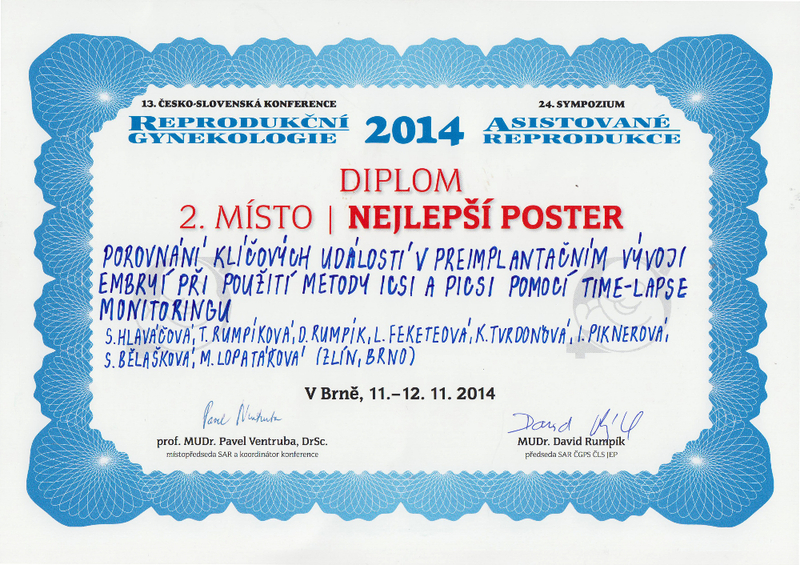 IVF Zlín has been awarded a Diploma at Symposium in Brno - IVF Czech Republic s.r.o. The competition took place at the joint event of 13th Czech and Slovak conference of Reproductive Medicine and 24th Symposium of Assisted Reproduction. The Director of Clinic of Reproductive Medicine and Gynecology Zlin Mr. David Rumpík, MD, who is also a Chairman of the Section of Assisted Reproduction of the Czech gynecological and Obstetrics Society, made a presentation at this event. It took place at Hotel International in Brno between 11th and 12th November. The theme of our banner was “The comparison of the key events in pre-implantation development of embryo following ICSI and PICSI method and using time lapse monitoring”.